BOULDER, Colo. - Dec. 28, 2018 - PRLog -- When anthropologist and healthy living consultant Zoe Weston was wrought with overwhelm and exhaustion, she decided to overhaul, streamline and downsize her living space to simplify and gain clarity. As a result, Weston saw noticeable improvements in her mood and overall life. That's why she's launching the Minimalist Sanctuary Healthy Home Challenge, a five-week regimen where Weston helps participants downsize, organize and declutter their lives to start the New Year in a refreshed and energized state. "With busy schedules in both work and life, many of us live in stressed-out states of overdrive," Weston said. "After implementing thorough decluttering in my own life—along with 20 years helping clients create healthy homes—I realized the drastic improvements that downsizing can make in someone's life." The Minimalist Sanctuary Healthy Home Challenge, available now via e-book, was derived from research that concluded a minimalist environment can thoroughly alleviate stress. For example, research by Princeton University highlights how physical clutter actually prevents focus and limits the brain's processing power. Weston's five-week, self-guided challenge delves into creating healthy living spaces, and how the healing aspects of light, color and scent can improve moods and lift emotions. For example, integrating hues of green into living spaces can help people feel fresh, calm and creative. "Daily life is stressful enough; that's why I encourage clients to transform their homes into safe, worry-free havens," she said. "It's easy to let clutter or mess build up over weeks or months, but there's no better time to set the groundwork for a stress-free life than the fresh start of a new year!" Weston's new challenge includes tips and tools designed to work for everyone. It's available as a do-it-yourself e-book download that ranges in commitment from two to 15 hours per week, depending on the challenge. For a more customized experience, Weston is also available to hire for in-person consultations. In addition to the Minimalist Sanctuary Healthy Home Challenge, Weston specializes in helping families create the healthiest foundations in life, from pregnancy to home sanctuaries. Her guidebooks, consulting, workshops and home design services have helped clients from Maui to Colorado reduce stress and live fuller lives. Weston is also involved in the childbirth space; she is a certified childbirth educator and prenatal yoga and dance instructor. She offers birth and postpartum doula services to ensure women and new mothers are comfortable and supported during labor and after birth. 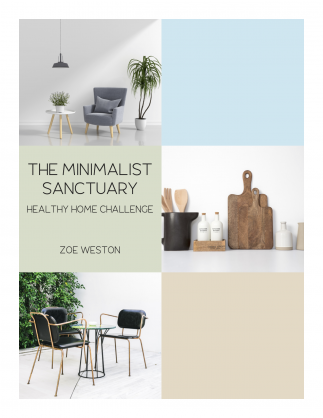 To embark on the five-week Minimalist Sanctuary Healthy Home Challenge, visit https://zoeweston.com/take-the-challenge/. Learn more about Zoe Weston at www.zoeweston.com.